David Petersen's Blog: From the Vault: TOWER! I'm opening the Petersen vault (as I did with Jesters) on a game project. It started while playing the old TSR board game Dungeon. My pal Seyth and I were complaining about the flaws in it and how we would fix the flaws. It ended with a year long (not full time, we were both still in college) development of our game: Tower. 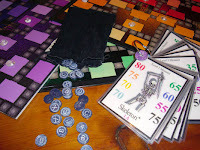 Having played it on assorted game nights I can attest that it's not that much better than Dungeon, but because we made it, it has a soft spot in our hearts. Tower uses three different kinds of cards. Treasure cards can be either worth gold or have a use in gameplay. They are separated into 6 levels (one for each floor of the tower) with level 1 being least valuable and 6 being the most. Spell cards help magic users keep track of what spells they know and which they have used. And after years of playing we decided to help balance some of the characters who weren't as well off with hand-drawn item cards. Each character gets 1 item specific to them at the start of the game. Unfortunately, this didn't completely balance anything, but made for other quarrels about how fair/unfair someones personal item is. 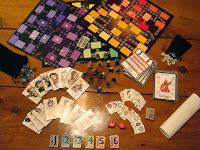 The game is played on three separate boards each showing 2 floors of the Tower. 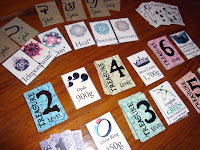 I layed out the boards in Pagemaker and have since lost the files (and my copy of page maker...good riddance). I originally wanted to have the boards stack and pivot out of the way to access the lower sections, but the design proved too tippy or heavy. This photo also shows the 'Monster manual" that is indexed as to which monsters appear on which levels. I id most of the artwork for the manual, but Jesse Glenn (Kenzie) provided several of the creature art pieces. Some of his are the most loved/memorable in the game (like the Owlbear). In addition to making the characters all unique in the game, they all needed artwork and miniatures for gameplay. 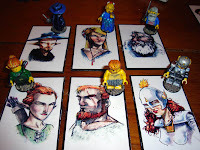 I customized Lego figures, drew portraits of each character, and fabricated character cards that could stand up to drunken use. I added sculpy to the legos and baked them in the oven at a low temp, so as not to distort the lego plastic too much. 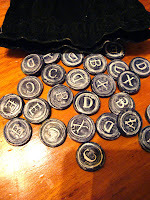 To randomize which monsters appear in which room, I made lettered tokens 'A'-'E' & 'X'. I rolled out sculpy, stamped them with a rubber monogram stamp and then cut them into chips with a piece of thin walled brass tube. It was when I was fabricating these pieces that Julia and I were dating and getting serious. She still says this game fabrication was a bit scary for her and she wondered if I was stable enough to be a good boyfriend. So there it is. A huge amount of work went into the game when I should have been studying harder or paying more attention to my girlfriend (especially when you consider how flawed it still is). But on New Years eve, it's the game that everyone wants to drag out and play. I have turned in my dummy copy of Snowy Valentine's Day to Harper Collins. I have a while to breathe and tweak the sketches before doing the final work, but I am very happy with the results. Obviously, I can't share too much of the book, but here is one of the pieces/scenes I am most proud of. 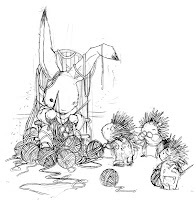 Jasper Bunny, looking for the perfect Valentine's gift for his honey bunny, visits the porcupine children who are knitting scarfs for their mother. Jasper learns he can't knit and that porcupine tots find that funny. I also got an opportunity to do some work that will be featured on products for comic book artists (not sure if I can reveal who/what yet). I was asked to do a few sample panels in my style, but without being something already under copyright etc. 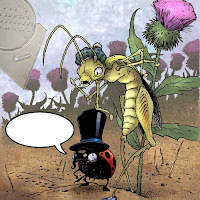 The Ladybug with the top hat and moustache still cracks me up a bit. Yes, truly nerdy indeed. That's what I enjoy about you, though. I think I may have drunkenly yelled at you at the Mid-Ohio con this year. I apologize for that. You were incredibly understanding at the time, and stood there and talked to my friends and I about all sorts of awesomeness. Looking forward to more Mouse Guard. Thanks for proving how cool comics creators are. So no way to get your boards or cards so we can try it. The boy and I have Dungeon'ed quite often. His more covetous friends used to have to play it every time they came over. I can't wait for Snowy Valentine's day. I love the Porcupine tots! I am really geeking out over Tower!! Reminds me alot of Talisman but doesn't look like it would take an entire weekend to play one game. :) That is too cool!! Sorry, just had to exploit the humor-potential of your parenthetical comment. I really appreciate the obvious love and enthusiasm you put into each issue of Mouse Guard. It deserved those Eisners!